This article, you may be happy to learn, is the last in this series about options and time value. We introduced the topic in part 1, and expanded on it in Part 2, Part 3, and Part 4. Today, we wrap up that series with the description of an important relationship between the time value of Puts and of Calls (time value is also called Extrinsic Value). Understanding this can help us to know which option strategy to choose in any particular situation. The concept is called Put-Call Parity. It can be stated in more than one way. One pretty succinct statement is that the extrinsic value in a Call option at a given strike must be the same as that in a Put option at the same strike, after adjusting for carrying costs. The blue horizontal bar graphs above depict the amount of extrinsic value in each option. The exact amount is shown in the columns labeled Extrinsic and highlighted in light blue – calls on the left, puts on the right. Our point this time is that the amount of extrinsic value for the call option at each strike is very close to that for the put at that strike. This is true even where the total value for the two options at a given strike is quite different. This turns out to be important. Look at the options at the 67 strike, which was about one dollar above the EFA’s price of $66.02. On the left, Bid and Ask for the call are shown as $.16 and $.19. The midpoint between the two, rounded up, would be $.18. The 67 call’s Extrinsic value is shown as $.18. Being out of the money, the call had no intrinsic value, so that $.18 was its total value. On the right, the 67 put’s Bid and Ask are shown as $1.09 and $1.15, with the midpoint therefore at $1.12. The Extrinsic value of the put is $.14, just $.04 away from the 67 call’s extrinsic value of $.18. But the put’s $.14 of extrinsic value is not its total value. In addition, it has $.98 of intrinsic value ($67 strike price less $66.02 stock price), for a total value of $ 1.12. It turns out that at any strike on the chain, the call’s time value is a few cents more than the put’s at that strike. Why is this? More to the point, why is it important? We’ll answer the “who cares” part first. Remember that the Extrinsic value is the elastic part of an option’s value. Although it is inexorably wasting away to zero over the option’s entire lifetime, it also responds to the moment’s expectations for the stock. The extrinsic value in an option can temporarily grow or shrink substantially in an instant as expectations change. In any trading situation, we need to know if the current level of extrinsic value is more likely to grow or to shrink. If the extrinsic value is much higher than normal, it will probably shrink back to normal. If it is much lower, it will more likely re-inflate back to normal. If this growing-shrinking was a random process affecting all options differently, it wouldn’t help us to know that it existed; but that is not the case. When extrinsic value grows in some options on the chain, it must grow in all of them, and in a seemingly coordinated way. When extrinsic value shrinks, likewise, it must shrink across the board. This helps us to know that if we have chosen a strategy that benefits from extrinsic value growing, and it does grow, it will certainly grow for the particular options that we have chosen. And, if we have chosen a strategy that profits from a shrinkage in extrinsic value, then when one shrinks, they will all shrink. There are other benefits, but that alone is more than enough. All right, but then why does it happen that way? Imagine that it didn’t. Imagine that at that 67 strike, the puts were at their actual price ($1.12, including $.14 worth of extrinsic value), but the calls had much more extrinsic value than they actually do. Let’s say that instead of trading at $.18. they were a dollar higher, at $1.18. The calls would have $1.18 of time value, which would be “too much” time value compared to the puts’ $.14, by about a dollar. If that unusual pricing of the options happened, it would be possible to make a risk-free profit. A trader could buy the puts and simultaneously sell the calls short. She would have bought $14 of time value in the puts ($.14 of extrinsic value times 100 shares per option contract). And she would have sold $118 of time value in the calls. Overall, she would be short $104 of time value ($14 – $118). It is a certainty that all time value will be gone when the options expire. So she would have locked in a gain of $104 on the time value portion of the options. Both buying puts and selling calls short are bearish positions (both gain if the stock goes down and lose when the stock goes up). To hedge against upward stock movement, the trader would also need to buy 100 shares of stock. The interest cost to borrow the money with which to buy each share of stock and hold it until expiration would be $.04. In this scenario, it now does not matter how the stock moves. 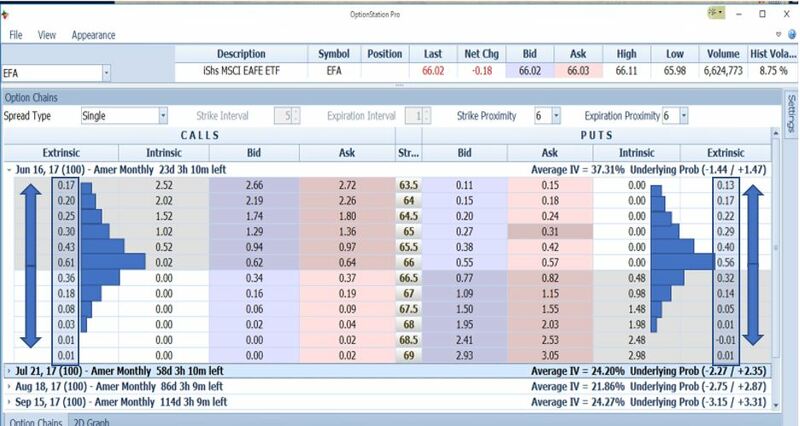 When the options expire, both the put and the call will have zero extrinsic value. One of the two will be in the money at that time, but not both. The in-the-money option will be worth whatever its intrinsic value is. The other option will be worthless. Whatever the gain or loss on the put/call combination, the loss/gain on the stock will exactly cancel it out, except for a profit equal to the difference between the original extrinsic values of the calls and puts – a profit of $1.04 per share. Subtracting the interest cost of $.04, the net result would be a gain of $100, or $1 per share, no matter what. This $1.00 is exactly the amount by which the calls were originally overpriced. Any small mis-pricing of time value across the option chain is instantly detected by the computer systems of big traders. So, the mis-pricing is never allowed to grow beyond a penny or two. The end result is that when extrinsic value grows anywhere due to excess demand, it grows across the board, and in both puts and calls simultaneously. The same is true when extrinsic value shrinks because of excess supply/lack of demand. Ultimately the mathematical precision of the relationships between option prices is a force that we can harness. That gives us a strong edge – and that’s what a trader needs. Podcast Ep.18 - Would you trade in front of other people? So You Think You Can Retire? Your Fixer Upper Is Ready for the Flip – What’s Next?!?!? Which Side of This Trade Would You Have Been On? How good are you at recognizing Elliott Wave Patterns?